Can you believe it's almost the end of October? Geez, I know I can't. For my family, the very end and very beginning of each year are time periods that jam-packed with celebrations for the holidays, of course, but we also attend multiple family birthday parties. It's just how the cookie crumbled for us that the majority of family birthdays, on both sides, are in the fall and winter months. Throughout the upcoming weeks, we'll stay busy attending and hosting parties so that means that I'll lean heavily on dishes that know are delicious, impressive... and easy. This Rustic Caramel-Apple Upside Skillet Cake is a perfect example of the sorts of recipes I keep around for special occasions. Your friends and family will be treated to a feast for their eyes and their tastebuds when this cake is is served for dessert! And the best part of it all is that it will look like you spent hours working on it, when actually this recipe is super simple! That's pretty much a textbook example of a win:win deal if I've ever seen one, right?? Just as a side note, October is National Apple Month in the USA! So, even if you don't have any special events pending on your calendar before Thanksgiving or Christmas, National Apple Month is a perfect reason to make one of these pretty little cakes. 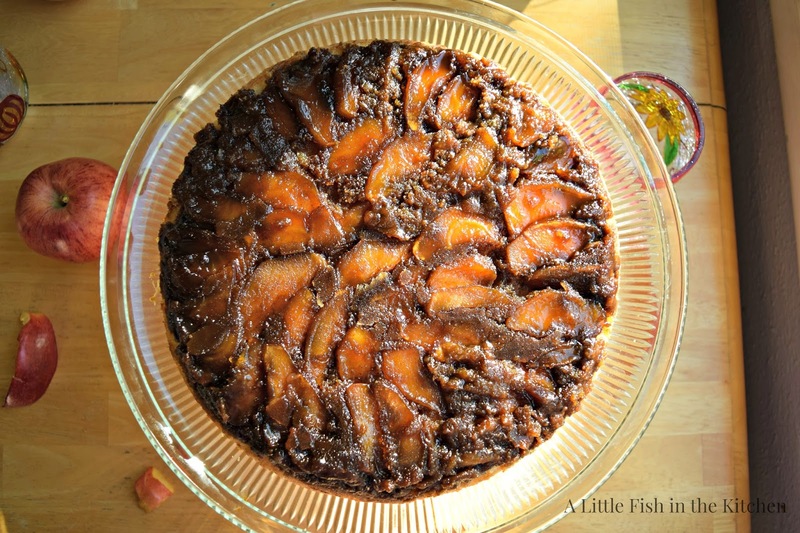 This Rustic Caramel Apple Upside-Down Skillet Cake is a delicious way to pay tribute to one fabulous fall fruit! I like to make this cake using dark brown sugar because we enjoy that extra pop of molasses flavor, but if you're not a fan of the same, light brown sugar can be used instead. Also, sweet, firm apples, like Gala or Fuji are my go to fruit for this cake and lots of other baked goodies too. Lately, I've been using my iron skillet for everything, so I just had to make this a skillet cake, but if you don't have an oven safe skillet around, you can use a 9-inch (9x2) cake pan instead. I include a brief, instructional video I made for you here so you can see just how easy it is to make this pretty cake! For the time being, I let my hands do the talking in these videos and I don't add any dialogue. My 3 year-old daughter has a hard time with this and says I have to include a "thumbs-up" for her in each new video I make so she knows it's me. If you have a minute, I'd love to see you subscribed over on my You Tube Channel, I'm working up lots more video recipes to share over there! This is an eye-catching, delicious dessert that's sure to impress. It's a gorgeous way to celebrate fall and National Apple Month in October! Pre-heat the oven to 325°. First make the topping. Melt 3 tablespoons butter in a 9-inch iron skillet. Add apples and saute until tender. Stir in cinnamon, mix well and remove cooked apples from the pan and set them aside. Add 4 tablespoons more butter to the pan. Once butter is melted add in the brown sugar. Stir until sugar is completely moistened with butter (add more butter if necessary a tablespoon at a time). Turn off heat and use a silicon spatula to spread the sugar evenly over the bottom of the skillet (this makes topping layer). Then add the apple slices back to the pan. Arrange the slices over the brown sugar layer in a circular pattern. Set the skillet aside. Now make the cake batter. In the bowl of a stand-mixer or in a bowl using a hand-mixer, beat butter and sugar together until light and fluffy. Add in the eggs, one at a time, until incorporated. Stir in the vanilla extract. In another medium-size bowl, mix flour, baking powder, cinnamon together. Add the flour mixture to the butter mixture one half at a time, alternately with the buttermilk. Mix until batter is just combined. Using a silicon spatula, spread the cake batter evenly over the layer of apples in the skillet. Bake for 40-50 minutes or until a toothpick inserted into the center comes out clean. Allow the cake to cook in the skillet, for about 20 minutes. While cake is still warm, carefully flip the skillet over and transfer the cake to a serving plate or cake stand. Let the cake cool completely. Enjoy! Very yummy looking Marcelle. Love your sweet video tutorial and the fact that your daughter wants you to give a thumbs up....LOL Too precious. You should show the finished recipe photo with the Recipes Generator.....Great job. Hi Linda, thank you so much!! I'm loving the plug in! I totally love that dark brown top!! My mouth is watering, Marcelle. Love the video and I need to get an apple cutter too. Marcelle, this looks delicious. I live the rustic nature of cakes cooked in skillets. My family has a cast-iron skillet that has been used for 40 years. Enjoy the birthday and holiday celebrations that will indeed keep your family busy. 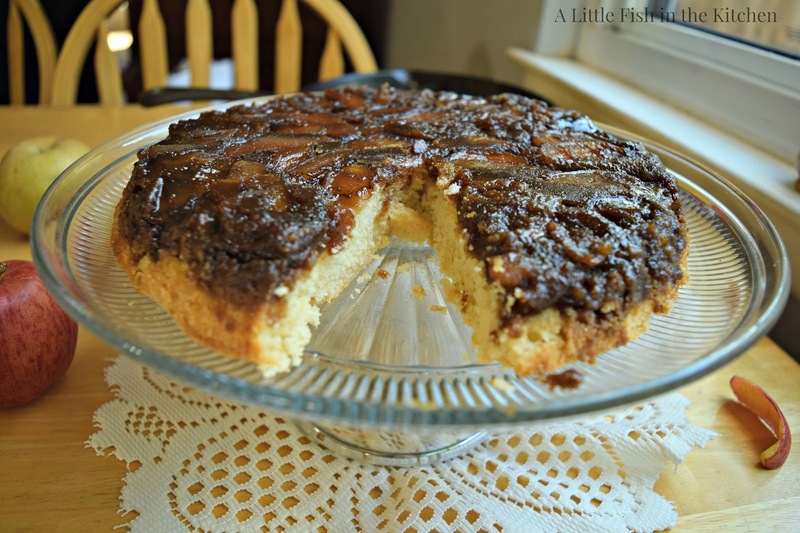 The brown sugar apple topping looks amazing, Marcelle! Great video!! Hi Marcelle, beautiful, gorgeous apple upside down cake. loved your video, could not figure out how to sign-up for them, or maybe I did and did not realize it, anyway the recipe plug-in looks fantastic. Hi Cheri, that recipe plug in is wonderful! Thank you so much! I want to make this solely because I want to make my house smell AMAZINNGGGG! Hi there Gigi, this cake will definitely help your house smell amazing! Thank you so much! What a great recipe to celebrate National Apple Month! 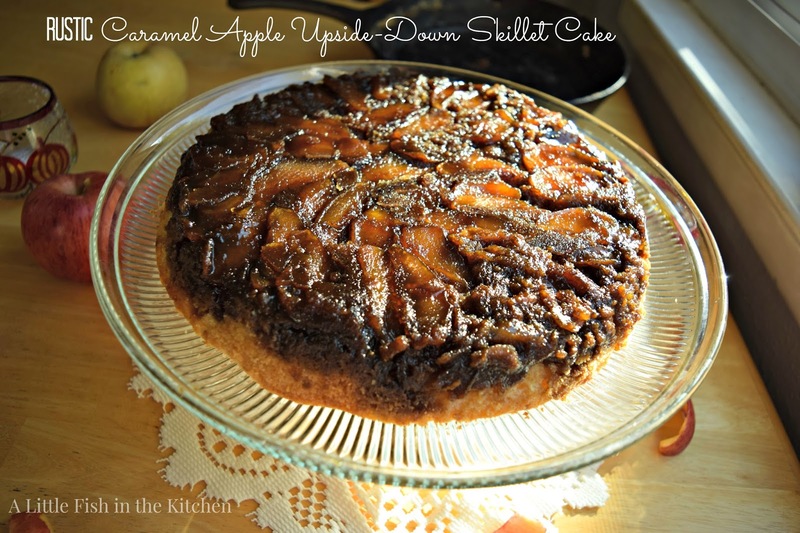 I love upside down cakes, though don't believe I've ever made an apple one. Gotta try this! Thanks so much. What a beautiful and perfect skillet cake, Marcelle! I, too, prefer dark brown sugar for that extra deep, rich molasses flavor. Look forward to giving this a try in the next week or so! This looks wonderful - definitely my kind of cake! I agree with you about using dark brown sugar in a recipe like this. Your cake sounds great. I'm all for caramel apple anything! This looks so pretty with that perfect pattern of apples on top.